One day in September 1993, four months after the F.B.I. had begun its espionage investigation of Aldrich H. Ames, the agents tracking him got their first chance to catch him in an act of spying. But nothing went right. Mr. Ames eluded them twice, once by awakening uncharacteristically early to drop off a message to his Russian contacts and again, later in the day, by escaping a stakeout at the parking lot of the Central Intelligence Agency's headquarters in Langley, Va. -- driving off "like a bat out of hell," one official recalls now. That day came to be known within the Federal Bureau of Investigation as Black Thursday. But, in an inquiry that careered like a roller coaster, the F.B.I. got its first big break just a few days later. Ignoring the warnings of their superiors, agents pilfered Mr. Ames's household trash, switching refuse cans in a nighttime operation that yielded a decisive find: a torn-up draft of a note from the suspect to his Russian handlers. A few weeks later, Federal agents broke into Mr. Ames's house and, in a search authorized by the Attorney General, found in his computer a wealth of incriminating data, including his procedures for secret communications with the Russians. F.B.I. officials, including senior investigators who supervised the inquiry and agents who ran it in the field, have previously been under strict orders not to discuss it. Now, almost a year after Mr. Ames's arrest, those officials, in response to numerous requests, have talked about the case in a series of interviews in recent days. Although Mr. Ames was able to elude detection for nearly nine years, those interviewed are clearly proud of their investigation's successful conclusion. This despite a House Intelligence Committee report that has criticized the bureau's officials for a "wait and see" approach to finding a spy who had done great damage to American intelligence. Mr. Ames, a counterintelligence officer in the C.I.A. 's Soviet division, began providing information to the Kremlin in 1985 and continued doing so until his arrest, along with that of his wife, Rosario, at their home outside Washington last Feb. 21. Over the years, the K.G.B. and its successor agencies in Russia paid him more than $2.5 million, in exchange for which he compromised more than a hundred Western intelligence operations and in effect sent at least 10 men to their death by identifying them as agents of the West. Mr. Ames last year pleaded guilty to spying for Moscow, and his wife pleaded guilty to a lesser espionage offense. He is serving a life sentence at a Federal prison in Allenwood, Pa. She is serving a five-year sentence in Danbury, Conn. The F.B.I. 's involvement in the case began with a fruitless analytical effort undertaken in the late 1980's, after two of the bureau's premier double agents, both K.G.B. men in Washington, had been recalled by Moscow and executed. In its search for the betrayer of the two men, the F.B.I. focused on Edward Lee Howard, a junior C.I.A. officer who had defected to Moscow. But the bureau concluded that although Mr. Howard might have known the identity of one man, he had not known the identity of the other. The search was then largely dormant until 1991, when officials of the intelligence agency told the F.B.I. of a string of operational disasters that could be explained only by the presence of a mole inside American intelligence. "What revived it was we realized how badly we'd been hurt," said Robert M. Bryant, then agent in charge at the F.B.I. 's Washington field office, who is now the bureau's top national security official. That realization led to the first large-scale cooperative counterintelligence inquiry by the F.B.I. and the C.I.A., an agency that had never before shared its operational files with its law-enforcement counterpart. Feuding between the two agencies dated from the era of J. Edgar Hoover, who died in 1972 after 48 years as F.B.I. Director. And it did not end with the decision to work together on the mole case. Mr. Bryant, a blunt lawyer from Little Rock, Ark., known within the bureau as the Bear, was a hardened criminal investigator who, angered by a C.I.A. culture of concealment that he thought was slowing the inquiry, clashed with his counterparts at the intelligence agency. His shouted threats to prosecute C.I.A. officers for obstruction of justice kept other F.B.I. officials scrambling to smooth over strained relations. Gradually, though, the investigators narrowed their list of suspects, largely as a result of a huge analytical effort that sought to track even the hour-by-hour movements of Russian officials in Washington back in the mid-1980's. Mr. Ames made every list. 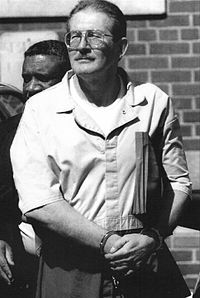 As an expert on Soviet affairs, he had had direct access to data on many of the operations involving the compromised agents. Moreover, C.I.A. officials had by then found hundreds of thousands of dollars flowing into his bank accounts from unexplained sources, and some of the deposits had been made shortly after his known meetings with a Russian Embassy official. On May 24, 1993, two weeks after the criminal investigation of Mr. Ames had formally begun, Mr. Bryant turned to Leslie G. Wiser Jr., a former Navy lawyer who ran an F.B.I. counterintelligence squad, to assemble a team of about eight agents, supported by dozens of technical and support specialists. They watched and waited. Then came Black Thursday. From their wiretaps on Mr. Ames's home telephone, agents had previously picked up cryptic comments suggesting that he was getting ready to deliver, imminently, a package to the Russians. But by the time surveillance units arrived at his home at 6:30 that morning, he had not only left -- subsequent review of videotape from a camera mounted across the street showed that he had departed at 6:03 -- but indeed already returned. "That was really unusual, because Ames was not really a particularly industrious guy," Mr. Bryant said. "For him to move out at 6:03 in the morning meant something was up." That afternoon, a surveillance team waited outside the C.I.A. 's main gates, hoping to follow Mr. Ames from his office at the agency's headquarters to a drop site. The agency's security guards, unaware of the operation, had rousted surveillance teams from the roadside once before, forcing them to pull back far from the exit. Around 4 P.M., Mr. Ames climbed into his Jaguar and in a moment had turned onto the George Washington Parkway. "And the guy gets out on the G. W. Parkway and just takes off like a bat out of hell," Mr. Bryant said. "And we lose him." The Director of Central Intelligence and the F.B.I. Director both knew that Mr. Ames was under surveillance that day. When they heard that he had escaped, they started "asking a lot of very painful questions," Mr. Bryant said. That night, Mr. Wiser said, he experienced "the depths of despair." But he was sure of at least one thing: Mr. Ames was behaving like a spy. After the setback, Mr. Wiser's superiors were wary of the step he next proposed: a search of Mr. Ames's trash. Mr. Bryant, fearful of aggressive moves that might alert the suspect that he was under surveillance, by his own account told Mr. Wiser: "Les, I don't think that's a very good idea. If we get burned on this thing, we can't ride too much heat." Mr. Wiser remembers matters a little differently. By his recollection, Mr. Bryant had at one point suspended garbage searches in the case but had not permanently barred them. In any event, Mr. Wiser decided to go ahead with the trash search, and on the night of Sept. 15, 1993, a black van with an open side door crawled silently up North Randolph Street toward the Ameses' house in wealthy suburban Arlington, Va. With Mr. Ames out of town -- he had gone to Ankara, Turkey, on C.I.A. work -- the time seemed right to take the offensive. "I am ready to meet at B on 1 Oct.
"I cannot read North 13-19 Sept.
"If you cannot see [ missing ] 1 Oct. signal North after 27 Sept. with message at Pipe." The agents quickly deciphered the note. It was a draft, written by Mr. Ames and then rejected by him, of a message to his handlers. "North" and "Pipe" referred to locations -- signal sites or drops where he could leave or get messages and pick up money. "B" referred to Bogota, Colombia, where he and his handlers were to meet. The agents sent the note to a laboratory for analysis and woke Mr. Wiser at home. Within an hour, in early morning, he was at his office, examining a black and white photograph of the note. "If there was a reservoir of doubt that existed before -- which there was, this little bit of doubt about what was really going on here -- it was gone," Mr. Wiser said. "We knew now. We had the right guy, for sure." When Mr. Bryant arrived at his office at the usual time later that morning, he saw Mr. Wiser grinning triumphantly. "I thought, 'Holy God, this is unusual,' " Mr. Bryant said. "Wiser looked like the Halloween pumpkin. I mean, he was so happy it was unbelievable. And that's when he came up with that note. In 27 years in the F.B.I., that's probably my favorite document." Later, Mr. Bryant would gladly forgive Mr. Wiser's disobedience in going ahead with the trash search. "That," he said, "is the finest piece of insubordination I've ever seen."